Available now from FarmTech Machinery , the Penta 1120 HD heavy duty feed mixer boasts a range of features that make it a high performance machine. Highly durable thanks to stainless steel conveyors, the Penta 1120 HD heavy duty feed mixer comes as either a single, twin or triple auger machine. 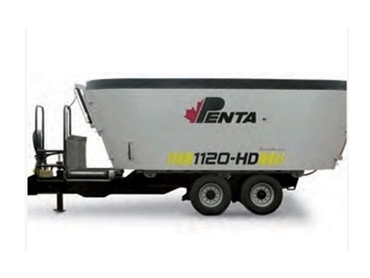 Penta also supply their heavy duty feed mixers with low profile trailers to make them easy to load with skid steer loaders and eliminating the costly need for industrial type loaders. These feed mixers require low maintenance thanks to fuel efficient clean sweep augers, which clean the mixer bowl out thoroughly, a highly important feature when feeding a variety of diets. For customer assurance and peace of mind, Penta back up their HD series of heavy duty feed mixers with a full five year driveline warranty.